Trent Armstrong lays one in for Wauseon during Monday’s game against Pettisville. He finished with 25 points to help the Indians hold off the Blackbirds, 64-56. 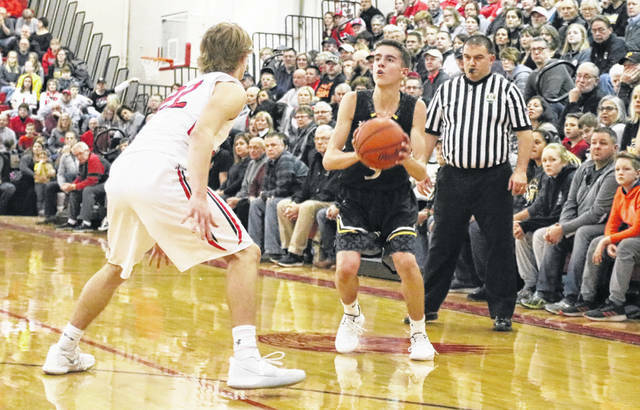 Logan Rufenacht of Pettisville, right, lines up his shot as Connar Penrod of Wauseon defends him Monday night. Detric Yoder of Pettisville looks to drive through the middle of the Wauseon defense. He racked up 12 points for the Blackbirds. The unscheduled day off may have helped. 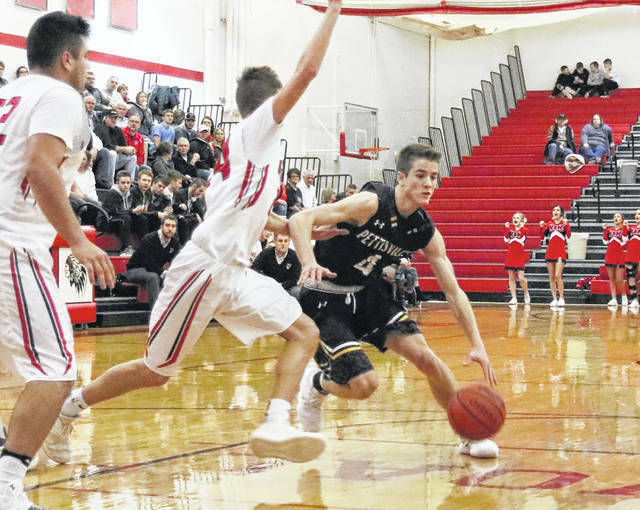 Playing a game on Monday after snow forced the postponement of the game Saturday, Wauseon was able to jump ahead of Pettisville twice, claiming a 64-56 non-league boys basketball win over the Blackbirds. Ahead by the smallest of margins at the half, Wauseon managed to pull away from Pettisville for a second time. Continuing to use the three-point shot, the Blackbirds hung around for a while until their shooting cooled off. Wauseon took advantage, and pulled ahead 51-43 by the end of the period. Free throw shooting helped out the Tribe. Wauseon went 7 of 8 at the line in the third period, and also went 7 of 8 in the final period when Pettisville put the Indians on the line. Pettisville scored to close the gap to 57-50, but Wauseon had an answer as Trent Armstrong slashed to the basket and scored. “Second half, I thought we did better job attacking the rim and getting to the free throw line,” stated Burt. Armstrong (25 points) and Levi Seiler (20) did a bulk of the damage for the Indians. Wauseon jumped out to a 22-13 lead by the end of the opening period, but Pettisville battled back. The Blackbirds knocked down seven treys in the first half, with the final one coming from Mitchell Avina to put Pettisville in front 29-28. 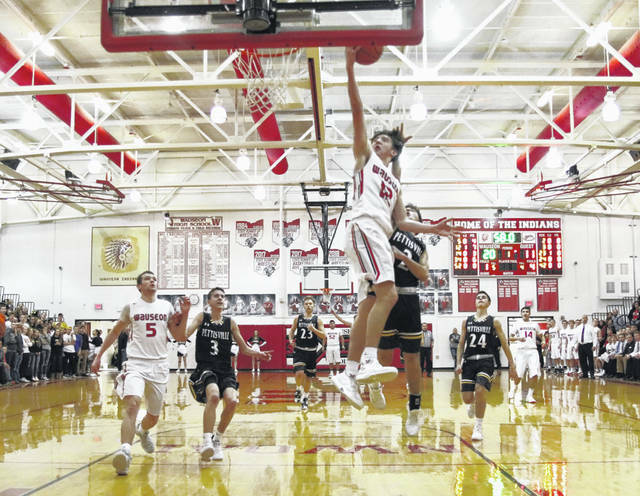 “We thought that we would get some open looks since Wauseon was sending help on our post feeds,” said Leppelmeier on his team’s ability to hit from long range. The lead was short-lived, as Armstrong scored with six seconds left in the half to give Wauseon the 30-29 halftime advantage. Logan Rufenacht led a balanced Pettisville attack with 13 points. Detric Yoder added 12 while Canidate Vickery and Graeme Jacoby each added 11 points. Wauseon (10-3) plays Friday at Liberty Center in Northwest Ohio Athletic League play and they host Rossford Saturday. Pettisville (10-4) hosts Hilltop Friday in Buckeye Border Conference play and travels to Liberty Center Saturday.